Buying A Rent To Own Home In Vancouver and Portland Metro Area Can Be Easy. We'd love to help you get into one of our Vancouver and Portland Metro Area Rent To Own Homes / Lease Purchase Homes. Bad or NO credit isn't a problem with us. Want to Buy A Vancouver and Portland Metro Area Home? Buying a rent to own home is not is not a problem, even if you have BAD or NO CREDIT, there is a good new for you! You’ve found the right place for a fantastic Vancouver and Portland Metro Area home. We help regular folks like you become homeowners because we believe in the American dream. We love helping our communities to grow and improve by empowering folks to accomplish something that they didn’t think was possible. Our success is measured by making a difference in people’s lives. We are happy to answer any questions you want to ask, and we can help you avoid scams. Even though rent to own arrangements can be great deals, there are definitely some scam artists in the real estate business. Want to learn more about the rent to own process? Click here now! Give us a call anytime at 360-209-4354 to find out how we can help you, or fill out the form below to get started now. Sounds simple, right? It truly is. Fill out the form BELOW to get the process rolling and see available Rent to Own Houses in Vancouver and Portland Metro Area! Yes Any Credit Treats You As People, Not A Number! "Finding yes Any Credit allowed us to pursue our dream of purchasing a home immediately without waiting to repair our credit. They understood our situation on a personal basis and treated us like people instead of a number. The home we found was beautiful. we were able to feel invested and take pride in ownership from the first day we moved in. I would recommend AnyCredit to anyone looking to purchase a home today!!! Why wait?" Crysti Sheldon "
Recent Bankruptcy - No Problem! "I would like to thank you for all your help in getting into my new house. I have been a business owner for the last ten years so I have not had the luxury of a consistent paycheck. This inconsistency has hurt my credit, forcing me to rent instead of own a home. With your help I'm now living and taking the steps in owning my beautiful home. You have been very flexible throughout the process, making the overall experience extremely positive!" 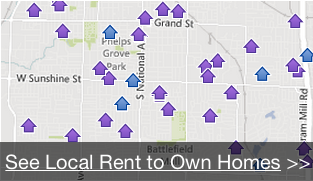 How can I find rent-to-own homes in Vancouver and Portland Metro Area? Why Rent to Own A Home In Vancouver and Portland Metro Area?